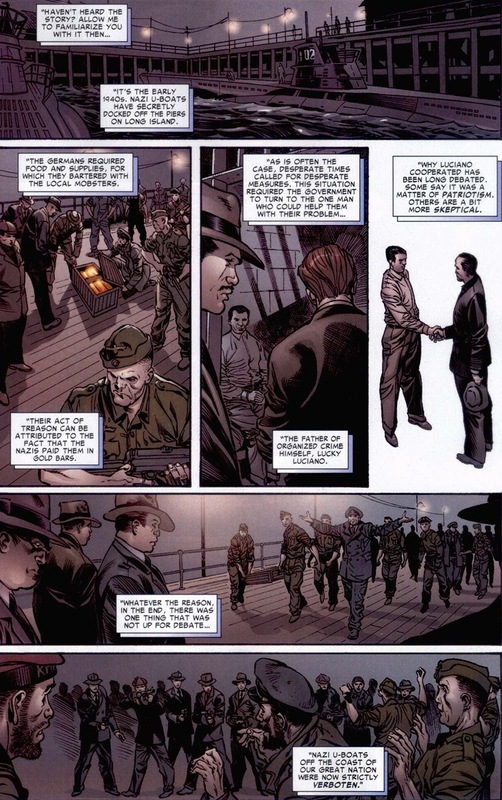 While Kingpin sat in prison for all of Marvel’s Civil War event, I’ve seen enough true crime documentaries to know that doesn’t mean he can’t contribute. But the fact that he appears at all speaks more to the sad notion that superheroes have to scrape the bottom of the morality barrel. 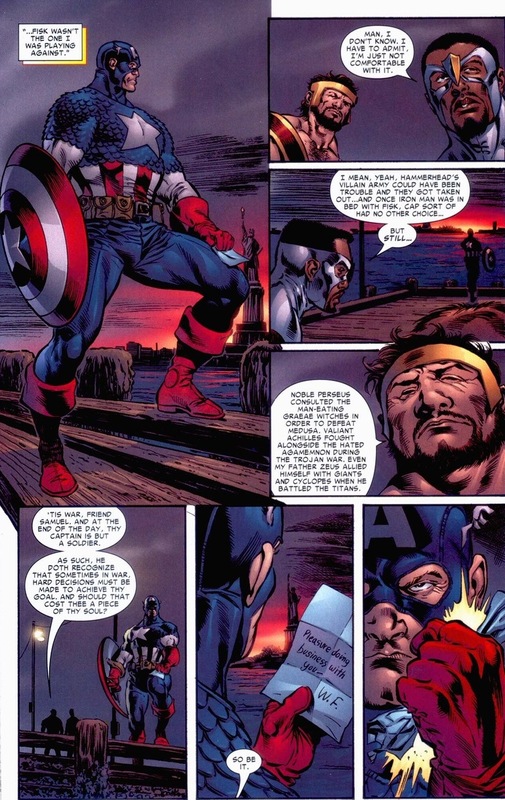 Captain America needs bad guys to flesh out his army and Iron Man can use his government influence if a baddie’s willing to beat up some of Cap’s guys. 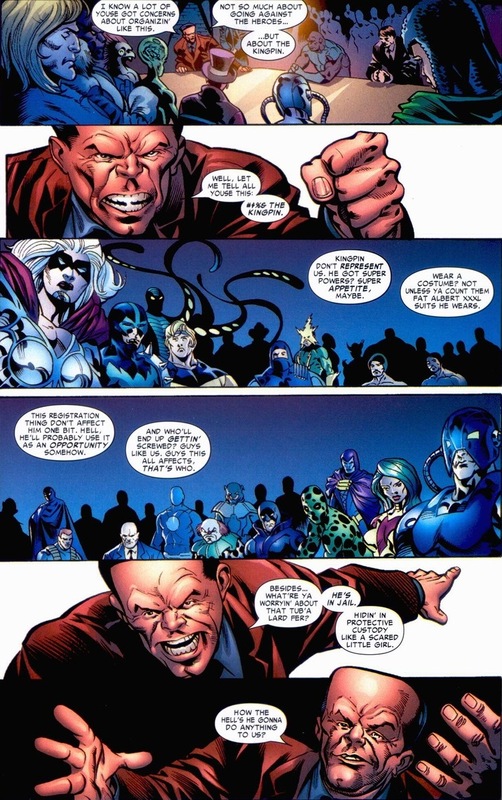 Really, the supervillains came out of Civil War the best — all except those two that ran into the Punisher. 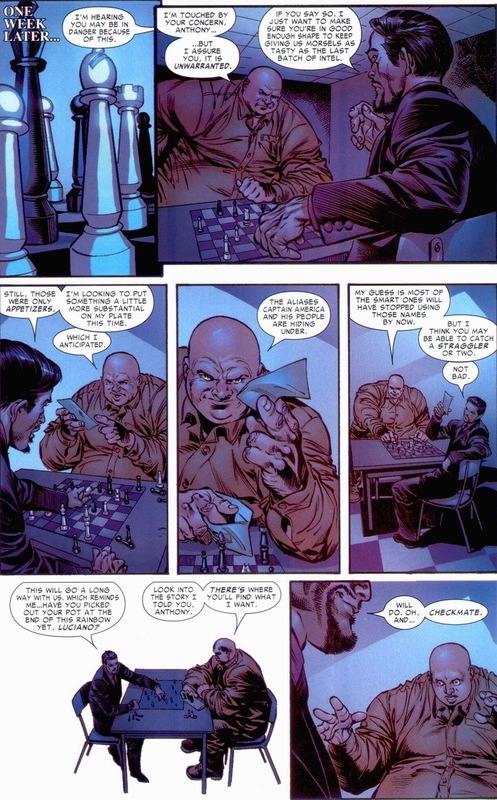 So with the stake of the costumed world at stake, today we’ll watch Iron Man play games with Kingpin in Civil War: War Crimes one-shot, written by Frank Tieri and drawn by Staz Johnson. 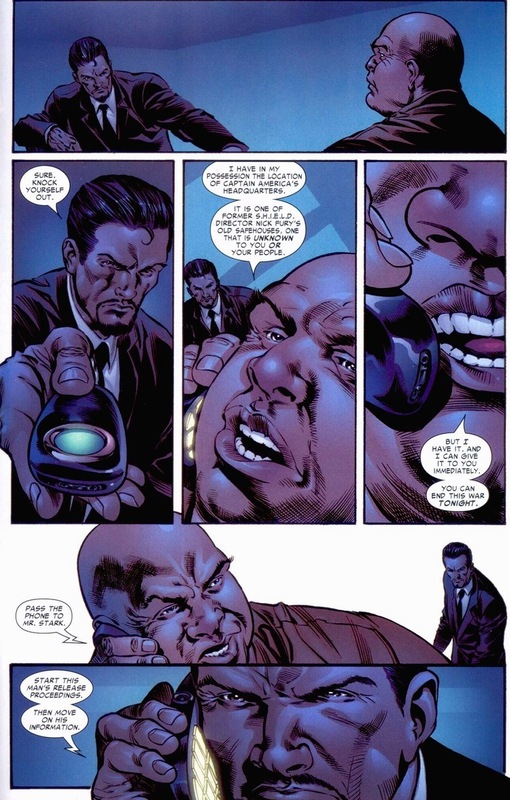 Kingpin, real name Wilson Fisk and the undisputed boss of New York City’s underworld, continually rises back to the top of the evil sludge pile despite having no superpowers beyond being five-hundred pounds of muscle. But he does possess two qualities that propel supervillains to center stage: intelligence and influence. That and a unrelentingly sociopathic brutality and a disposition towards uncompromisingly catastrophic violence. Though mainly the first two. Darn tootin’. No dumb man could ever hope to control all crime in a city filled with three superheroes per square block. Let Count Nefaria have Los Angeles. That’s for wimps. Though with rival Hammerhead released from prison, Kingpin’ll have to do more than rot in prison to keep his territory. Y’know, Spider-Man webbing henchmen to the walls or Daredevil breaking their skulls with a billy club can be tough, sure, but Scarlet Witch? That woman can cause you to live out actual hellish nightmares while your eyes bleed angry lava monsters. Plus, you somehow manage to injure her? It’s only a matter of time before her daddy Magneto comes through your skylight to rip the iron out of your blood and use it as an anchor to drown you in the nearest river. And Hawkeye with his adorable arrows. Anyway, turns out Iron Man isn’t bought by the generosity of supervillains (probably because he already has billions of dollars). 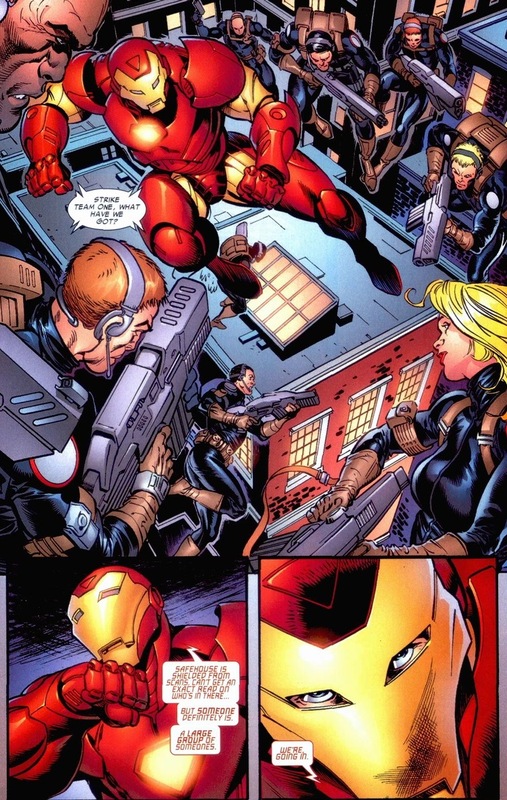 Still, even with revenge on his mind, Iron Man has some new friends that Kingpin can use. 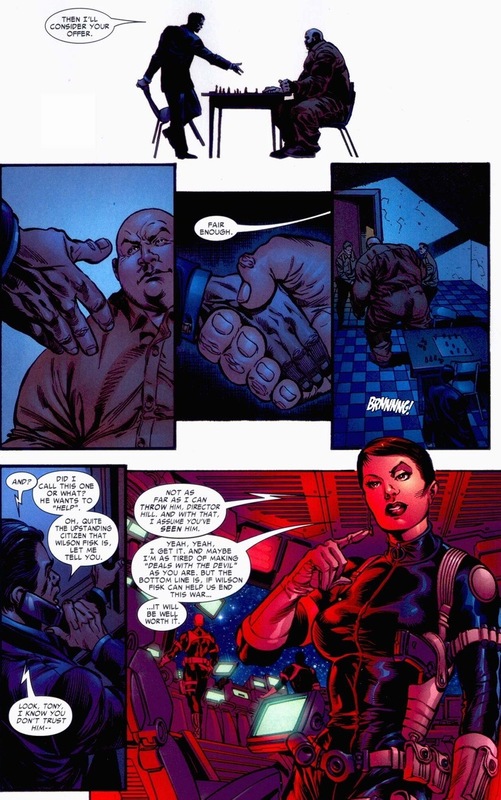 Maria Hill nailed the theme of the Civil War: the ends justify the means no matter how many marriages, relationships, friendships, or blurred moral lines need to be shattered. 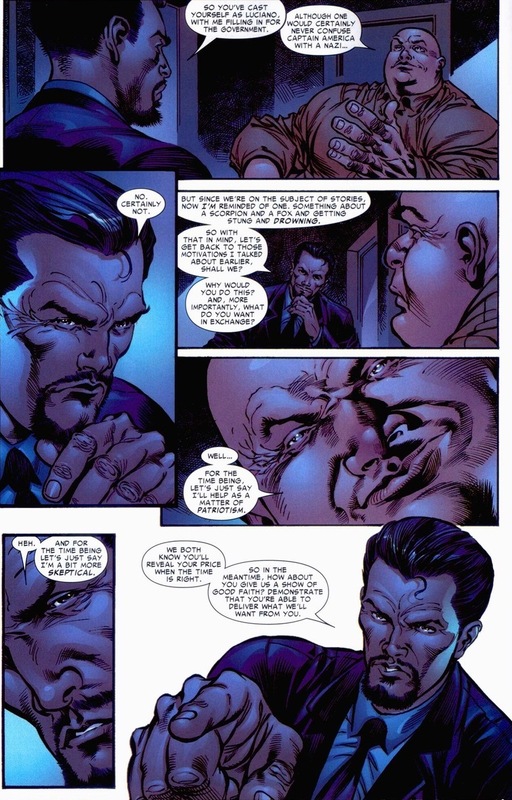 I know that the Marvel universe doesn’t live in black and white (the gray area helps keep it so great in the first place), but if Tony had spent more time punching bad guys and less time negotiating with supervillains to capture his best friend, the Marvel universe would have been a much better place. And that applies for Captain America too. 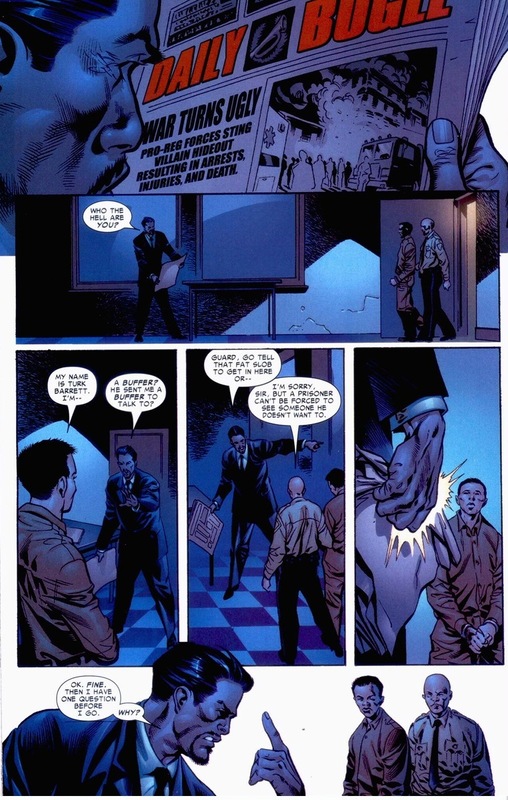 Fisk is not a super genius. He can’t master nuclear biology or understand the technology used to create web shooters, but the dude has street smarts the size of his dinners. And we’ve all seen enough movies or played that one Mass Effect DLC to know that the information trade will always be more valuable and dangerous than weapons or superpowers. 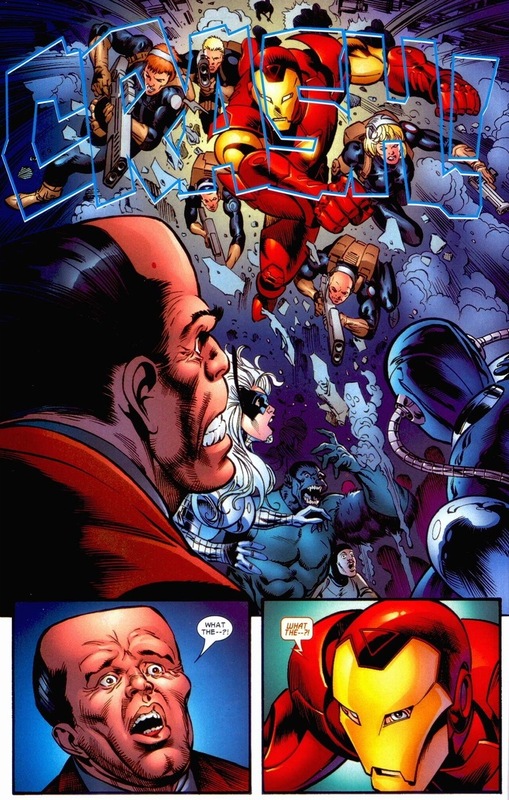 I wonder just how sleazy Iron Man feels every time he breathes in that greasy Kingpin air. That’s right, my friends. 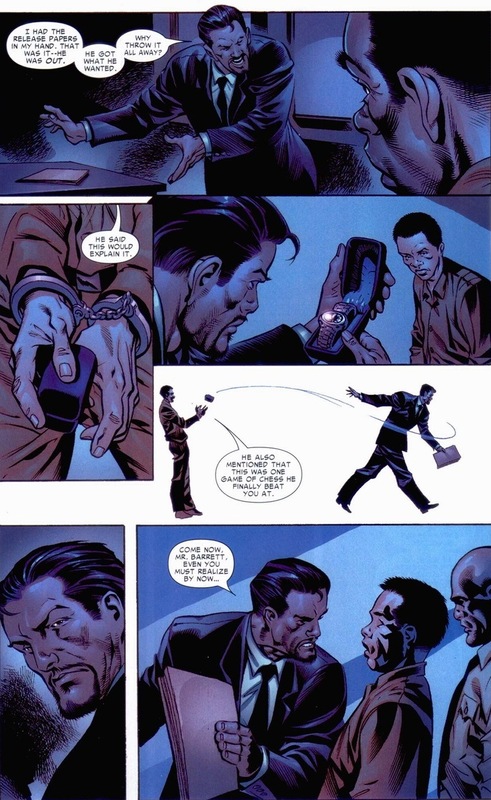 Kingpin just had Iron Man take out Hammerhead for him, clearing the way for an underworld rebuilding once Fisk gets out of prison. 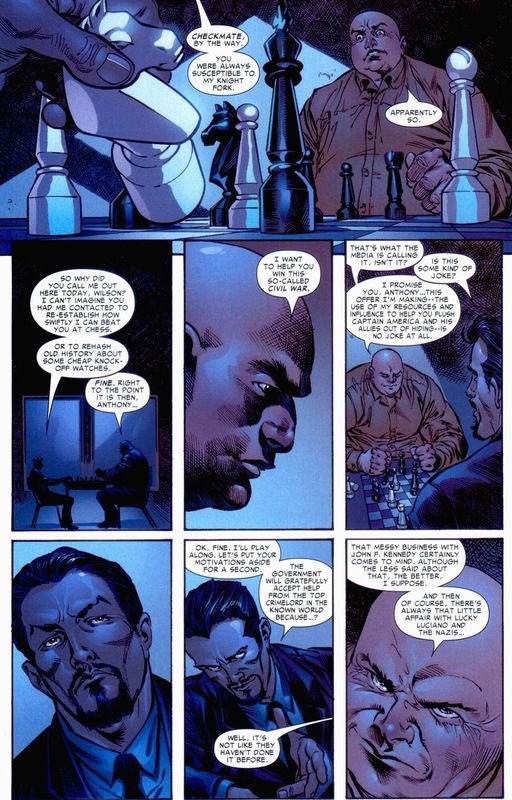 And yes, Kingpin won’t get that early release Hill promised him, but he accomplished his main objective beautifully and masterfully: vengeance. That smug jerk Tony Stark, sending in that punk Hawkeye and basket case Scarlet Witch to raid Kingpin’s warehouse after he accepted Kingpin’s gracious gift. And good riddance to Hammerhead too. 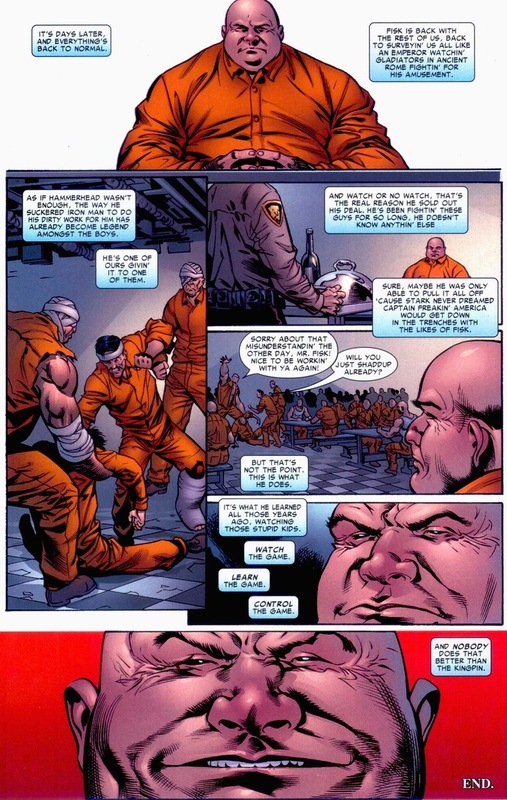 From three conversations in jail, Fisk compromised both sides of the Civil War, destroyed all possible competition, and regained his position at the top of supervillain food chain. Yeah, Kingpin smiles now, but a few months later Spider-Man beats the ever-living daylights out of him in front of all his little criminal buddies. 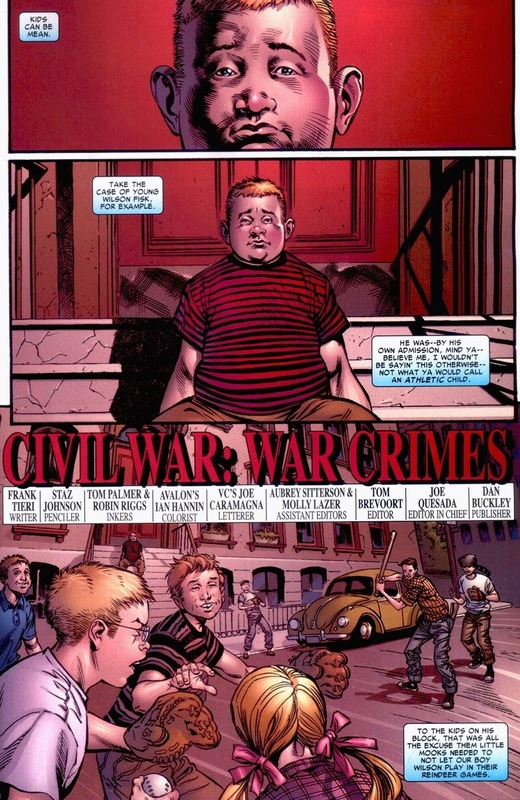 Still, for the rest of Civil War, victory tastes sweet and savory, much like his many, many, many meals. 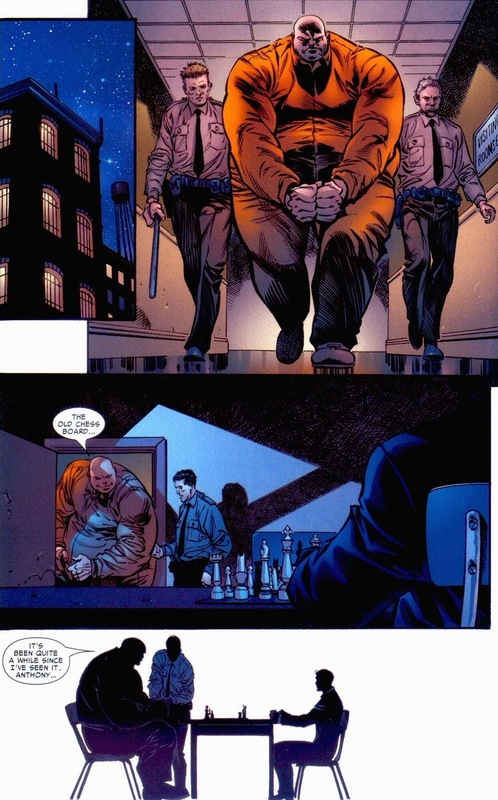 Well, there’s a reason he’s called the Kingpin. Thank you for this. 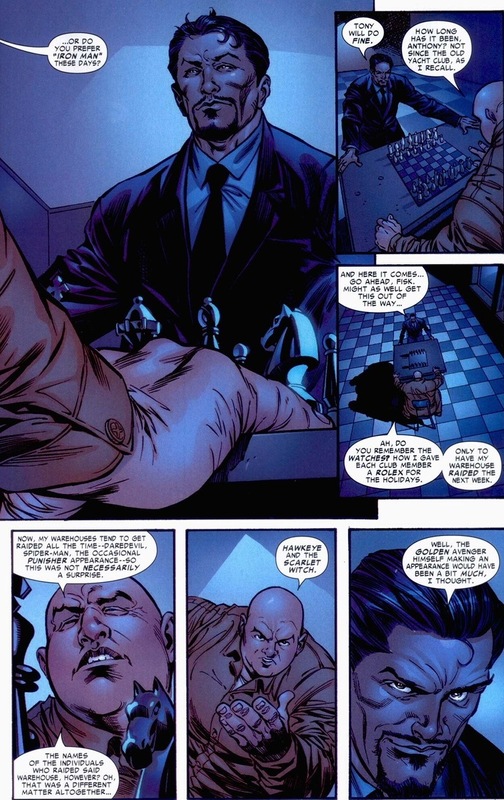 I hadn’t read this story, and have long been a huge fan of the Kingpin. He was once referred to as “a poor man’s Lex Luthor… but fatter”, and that was never the case at all. 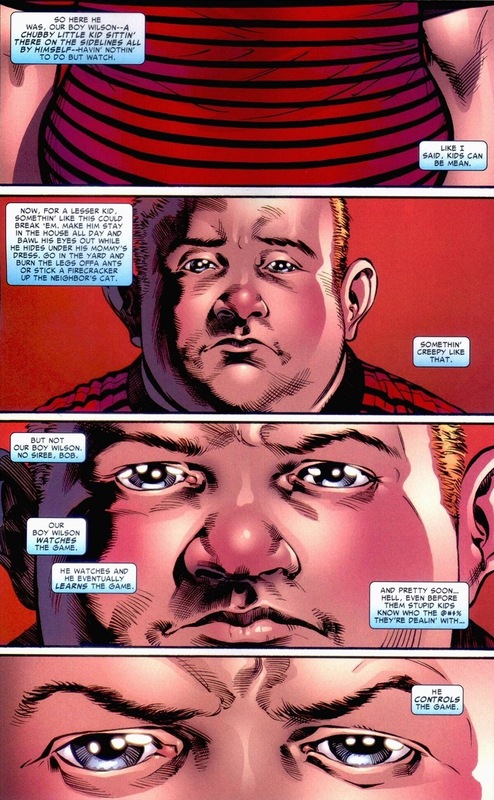 Get past his earlier stories in Spider-Man, and Wilson Fisk has become a very powerful force in the Marvel Universe. Like many other characters, both top shelf or far less popular, he has had his share of bad stories, but when you get down to it, he is cunning, and dangerous, and far more than meets the eye. 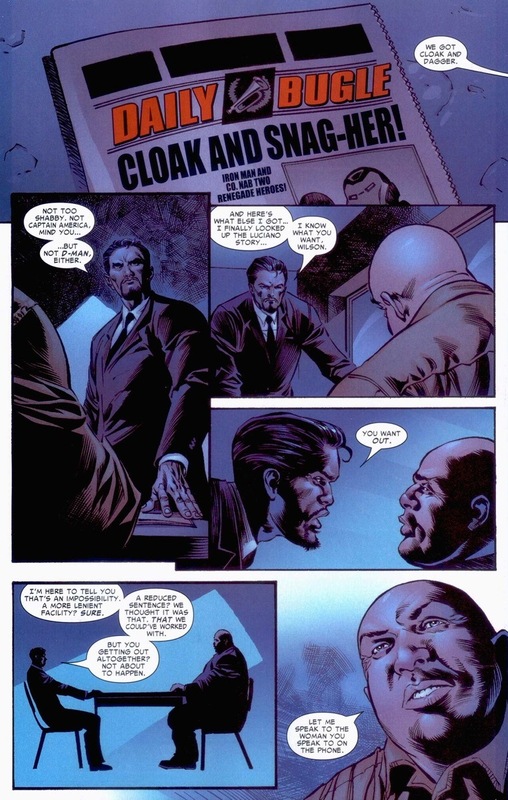 And when you are talking about a guy who fills your vision the way Fisk does, that is saying something indeed.